The HP LaserJet Pro 400 M425dn monochrome laser printer delivers high-quality output and the ability to scan and copy, over a network, and work as a standalone copier and fax machine. This device is an ideal choice for workgroups that are looking for productivity. High capacity HP LaserJet Pro 400 M425DN toner cartridges delivers black and white copies at lower cost. The device comes in black colour along with 3.5-inch touchscreen control panel, offering user-friendliness. The HP LaserJet Pro 400 M425dn has 800 MHz processor with 256 MB of RAM. It supports web-based printing apps and mobile printing features including Hp’s ePrint and Apple AirPrint. The HP LaserJet Pro 400 M425DN includes both a letter-size flatbed and an automatic document feeder (ADF). The printing resolution of this printer is 1,200 x 1,200 dpi. It features built-in ethernet for better connectivity and an automatic duplexer for double-sided printing that helps in saving paper. This device can be used as a standalone fax machine and copier. The input tray is capable of storing up to 250 sheets of paper and it has a 50 sheet multipurpose tray. The device also supports additional 800-sheet optional input tray. The HP LaserJet Pro 400 M425dn is a potentially good choice as it delivers scanning, copying and faxing capabilities. It’s high-quality text and versatile media handling might be an added advantage to any small or large workgroup. The device also has a built-in ethernet and automatic duplexer, providing environment friendliness. This printer might be a good choice for large business as it supports additional 800-sheet optional input tray to handle large print jobs. Low cost LaserJet Pro 400 M425dn toner cartridges are also an added benefit for anyone going with this printer. How to resolve the smearing problem in a HP Laserjet Pro 400 M425DN printer? HP Laserjet Pro 400 M425DN printer is popular for its high-quality output, fast speed, and good paper handling. Though it proves to be a feature-rich, all-in-one laser printer for your workplace or home, you may encounter some printing problems. Printing issues such as streaks, smears, broken prints, missing colours, black prints are generally observed. Many times the causes of these problems are not as huge it seems, it can be an empty or low-level HP Laserjet Pro 400 M425DN toner cartridge or may be poor quality media. Use laser-printable paper for best results. If you are unaware about the kind of paper to be used for printing, you can check printer instructions provided in the user manual. Turn your PC on and check the print settings (both standard and advanced) in the print dialogue box to ensure that the print weight selected for the paper is suitable for the printouts. If the printer is left uncleaned, it will start producing printouts of low quality. So, consider cleaning your printer frequently to ensure long lasting use. After you finish the cleaning process, make a test print on the paper to see if the problem has been resolved. If it does not, then it might be an issue related to the HP Laserjet Pro 400 M425DN toner cartridge. If the problem is still there, try installing a new HP Laserjet Pro 400 M425DN toner cartridge. Toner cartridge defects can cause smearing when printing documents. When installing a new toner cartridge, ensure that the lid is shut and the cartridge is properly locked into the place. Again, test run a page to see if the problem is fixed. If you have tried all the above steps and still the printouts are blurry or smeared, we would recommend you to contact HP support. Q. Are coloured HP Laserjet Pro 400 M425DN toner cartridges also available for sale? A. The HP Laserjet Pro 400 M425DN is a monochrome printer that is capable of only printing in black and white. Thus, you will not find coloured toner cartridges for this printer anywhere, as it does not support coloured printing. Q. How many pages can HP Laserjet Pro 400 M425DN printers handle at one time? A. HP Laserjet Pro 400 M425DN printers come with an input tray that handle 250 sheets of paper and a multipurpose tray that can handle up to 50 sheets. This printer also supports an additional optional tray that handle up to 800 pages. Q. Is there any way I can get a discount on your HP Laserjet Pro 400 M425DN toner cartridges? A. Yes, you will get the discount of 5% for your first purchase from our website. Use the coupon code “DIS5” at the time of checkout. You will also a discount coupon of 5% if you follow us on Twitter or follow us on Facebook. Also, you can choose to buy our cartridges in multipacks which is cheaper than buying individual cartridges. This will also help in reducing your overall costs. Q. How do I replace my HP Laserjet Pro 400 M425DN toner cartridge with a new one? Open the toner cartridge door of the printer. Pull out the empty toner cartridge from the printer. Remove the new cartridge out of its packaging and redistribute the toner by gently shaking it. Bend the tab on the side of the cartridge till it breaks loose and pull it until the protective tape is removed from the cartridge. Place the toner cartridge inside the printer and gently push it until it is firmly into place. Close the toner cartridge door. The installation of the new toner cartridge is complete. Q. Do HP Laserjet Pro 400 M425DN toner cartridges come with a warranty? A. Yes, our cartridges are warranted to be free from any type of defects. If you encounter any problem with our products, please contact us on 048 308332211 or email us on info@printerinkcartridges.ie regarding your issue within 30 days of receiving the product and we will be happy to help you. Q. Can I order the cartridges in bulk and store them for long? A. Ordering the products in bulk won’t let you lose the warranty. The product comes with 12 months warranty period, hence you can order them in bulk, but do confirm that your product is available for bulk purchase. Q. How many pages are your compatible HP Laserjet Pro 400 M425DN toner cartridges capable of printing without having to be replaced? A. Our compatible HP Laserjet Pro 400 M425DN toner cartridge can print up to 6000 pages without having to be replaced. Q. How long would it take for the product to be delivered to me? A. We usually deliver the products to our customers within 1-2 days, if they are ordered before 12 noon will get delivered same day. If your order is urgent, you can reach out to us on 048 308332211 and we will try our best to deliver the product to you as fast as possible. Q. Will there be any difference in print quality If I use compatible ink cartridges for my printer? A. We at Printerinkcartridges.ie tried our best to get you with the good quality products that won’t affect your printer, that is why our compatible HP Laserjet Pro 400 M425DN toner cartridges are tested to the highest quality standards to give you the same high-quality printouts and page yield as you get using the equivalent original ones. Q. What is the maximum print resolution that HP Laserjet Pro 400 M425DN printers are capable of printing? 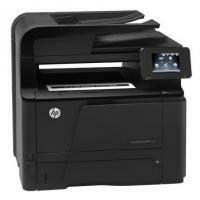 A. HP Laserjet Pro 400 M425DN printers can print up to a resolution of 1200 x 1200 dpi printouts. Q. How to produce high-quality documents time after time? A. One can always print high-quality documents and photos using good quality HP Laserjet Pro 400 M425DN toner cartridges. You need to stay productive with the HP reliability. You can easily save your time while using the genuine range of HP LaserJet toner cartridges that are more reliable and are much easy to install. One can also print more affordable, using the optional high-capacity and good quality compatible HP LaserJet toner cartridges. Q. Why does the toner cartridges I have recently bought, not fit into my printer? If you still have doubts as to whether you have the correct HP Laserjet Pro 400 M425DN toner cartridge then please contact the customer care support for more information. Q. How to resolve the Fax error messages of the printer? A. Various alert and warning messages might appear temporarily on the screen and require you to acknowledge the message by touching the OK button to resume, or by touching the Cancel button to cancel the job. With the certain warnings, the job might not complete or the print quality might get affected. If the alert message displayed is related to the printing and the auto-continue feature is on, then the product will attempt to resume printing the job after the warning has appeared for 10 seconds without giving an acknowledgment. Q. How can I test the HP Laserjet Pro 400 M425DN toner cartridge is working in my printer? A. Thank you for your query. There is usually a function to make a test print and this option is available in the menu options on your printer. If you are unable to find this please consult your user guide that came along with your printer you will find step-by-step instructions there to make a test print. I hope this will help but if you have any further queries you can also contact hp support system for help. Q. Can you tell me the scan file formats supported by the HP Laserjet Pro 400 M425DN printer? Auto Select: Use this setting when you are not concerned about the quality of the copy. This is the default setting. Mixed: Use this setting for documents that contain a mixture of text and graphics. Text: Use this setting for documents that contain mostly text. Picture: Use this setting for documents that contain mostly graphics. From the Home screen on the product control panel, touch the Copy button. Touch the Settings button, and then scroll to and touch the Optimize button. Touch the arrow buttons to scroll through the options, and then touch an option to select it. Touch the Start Copy button to start copying. Q. Can you tell me how to check if my HP Laserjet Pro 400 M425DN toner cartridge is damaged? Q. I have an HP Laserjet Pro 400 M425DN printer and I purchased a new HP Laserjet Pro 400 M425DN toner cartridge. A black printout has been given just after the installation of the new cartridge? A. This is a common thing that can occur when you install a new HP Laserjet Pro 400 M425DN toner cartridge to the printer. It should be considered as a test print. Q. Are the listed cartridges for the HP Laserjet Pro 400 M425DN printer original and genuine? Or are they recycled? Will this HP 80X toner cartridge compatible with my printer? A. We sell both original and compatible (recycled) toner cartridges for the HP Laserjet Pro 400 M425DN printer. The originals are listed as “Original” and the recycled are listed as ”Compatible”. Our compatible toner cartridges are the high standard and are tested to provide the same quality prints as of the original ones. The HP 80X toner cartridge is high capacity and are same as the HP 80A, the only difference is the amount of toner powder is higher in the HP 80X cartridges. These HP 80X toner cartridges are fully compatible and will work perfectly fine with your HP Laserjet Pro 400 M425DN printer.